I do not recommend this service department at all . I booked my Elantra G/T for routine service, they estimated $292. For service that will include everything they have to do including oil change and air filter change .After I dropped my car for service they called me and said that they want to change the cabin filter and they want to flush the engine and want to change the brake fluid which is recommended at 48000 ( I have driven this car for 33000 KM so far) and they want to change my window wipers which I don’t have any problem with. All for additional charge. In addition a button on my Heater control started to push up and bent and a couple of weeks ago and a part of it chipped. I mentioned and showed a picture when I was booking for the service. They said that it is covered under the warranty and to remind them when I bring my car for service. When I dropped my car they told again that it is covered by my warranty, but they have to order the part. When I came to pick up my car they said that the Service Manager; Mr. Matt Leung has decided that it is from incidental force and it will cost me another 779.+ labor to fix it. And also 2 other buttons are broken due to the same reason. I have a picture of my Heater control and there is no other broken parts or buttons. I am the only one driving my car and never had an accident or incident. I am really disappointed at their customer service. I will not buy another Hyundai or use Open Road Hyundai service department again. My last two vehicles were both BMW 7series and my last 5 were all BMWs. I took the Genesis 4.6 for a test drive and bought it on the spot. 3 years later I can tell that I never need to to go back. I love that car so much that we went back and got a second Hyundai for my wife (a Veloster - man that thing is cool). The dealership is excellent with fantastic amenities (Great coffee machine) and coming in for service is always a pleasant no pressure experience. UPDATE MARCH 9 2017 Since my first review, I have now purchased 2 more Hyundais and have been nothing short of impressed with them. But one of the vehicles purchased at another dealership has had an ongoing issue which I really believed was major warranty problem and I wasnt getting anywhere at the other facility. I brought the Vehicle to OpenRoad Hyundai in Richmond and in one visit, the problem was solved. The staff are not just polite and courteous, but also very professional in their approach. 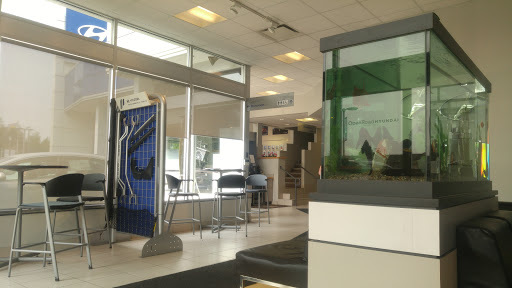 The dealership is bright and clean with a friendly atmosphere and waiting area in the service service department is very comfortable with fast free wifi and an awesome coffee machine. I cant believe I waited so long to come back. Id definitely encourage and recommend anyone to give them a chance for service and a new or used car. Just purchased a new Elantra from Open Road Hyundai and I couldnt be happier. This is the second vehicle I have bought there. My salesperson, Pierre Dubeau was fantastic! He is knowledgeable and really easy to talk to. Since I was traveling in from the Sunshine Coast for 1 day of car shopping he had everything ready to go as soon as I got there. The vehicles I wanted to test drive were available and ready for me. His low pressure sales approach was really refreshing and I felt that Pierre really made sure that I ended up making the right choice for me. After Pierre helped me decide on the car I was going to buy he handed me over to Tina Canave for financing. She was amazing and got me the low payments I wanted and was even able to include the extended warranty and pro pack treatment. They made a point of recognizing that this was my second purchase from them and I was rewarded for my loyalty with a lower financing rate. Between Pierre and Tina, the service and care I received was amazing. I felt like they really cared about my situation and genuinely wanted to help me. I will not hesitate to buy my next vehicle from Open Road Hyundai! Thank you Pierre! Thank you Tina! You just earned a customer for life!! Not impressed with the way the company maintained car services with customers. Without knowledge and understanding how their systems works, we as customers always seems to fall into their traps of package services. Which of course there is always an add ons for whatever reasons they have for you. I was basically being ripped off on the package service as well as their adds on to you with heavy labour charges including taxes and so on. Just wonder is it worth going there for car services or just to be ripped off by them for seemingly the repairs services was just basically an oil change or wheel balancing, or brake fluid change which impossibly can amount to CAD 622.25. If I were to go elsewhere it will amount less or maybe a more justified amount for the services rendered for my car. Especially for women who are easy targets to be easily ripped off by the technician. Be wise or think twice before one decides to go there for car services.